Updated & Expanded for 4.11 HuntaKiller Thank you for all that you contribute to the community Rama! Rama : You're welcome and thank you for this lovely addition! Interfaces allow different objects to share common functions, but allow objects to handle that function differently if it needs to. Any classes that use an interface must implement the functions that are associated with that interface. This gives you a lot of power over your game actors, allowing you to trigger events both in C++ and in blueprints that your game actors can handle differently. For example, the interface implemented in this tutorial enables you to have an interface like TimeBasedBehaviour, which has a function ReactToHighNoon, and have a bunch of actors respond to this event differently, each with their own behaviour. You can then have an event, SunReachedHighNoon that is triggered anywhere (such as the level blueprint, in an actor, or a static blueprint library) which can take any actor, check if it implements the interface, and if it does it can call any of the functions of that interface and the actor will act according to how that specific actor has the behaviours defined. This means you can trigger events anywhere and as long as you have a pointer to your actor, you can ask it to do specific things without needing to know its types because you can easily determine whether any given actor has an interface or not by casting an actor to that interface. If the cast succeeds then the actor does implement the given interface, and you can call functions using that interface. We will implement two interface functions: one which forces you to implement default C++ behaviour on any class which uses the interface, a BlueprintNativeEvent called ReactToHighNoon(), and one BlueprintImplementableEvent which does not force you to define default C++ behaviour, called ReactToMidnight(). The following is an example implementation of a ReactsToTimeOfDay interface. When following this tutorial and creating your interface, you'd replace ReactToHighNoon() with your function you want to force default behaviour, and ReactToMidnight() with your function that has no default behaviour. // Copyright 1998-2013 Epic Games, Inc. All Rights Reserved. Note checked for 4.18: GENERATED_UINTERFACE_BODY() and GENERATED_IINTERFACE_BODY(), can be now changed to GENERATED_BODY(), which is an updated version of those two that works for structs, etc, but errors could be a little confusing if you get compile errors since there's no way to differentiate. You could create an automatic interface to see how it looks now using Create C++ Class context menu on the content editor and choosing Interface type. You have to use multiple inheritance, and inherit from the IReactsToTimeOfDay class we created. The first inherited class will be the base class of your actor, anything you want, a ASkeletalMeshActor is used here as an example. virtual bool ReactToHighNoon_Implementation() override; This line tells your class that it has a function of this name and signature to inherit from the interface, which is how calls to the interface functions are able to interact with this class. UFUNCTION(BlueprintCallable, BlueprintNativeEvent, Category = "MyCategory") bool ReactToHighNoon(); This tells your class that you can both call and override this function in blueprints. You need this part as well if you want to be able to override C++ functionality within BP, as BlueprintNativeEvents are intended to be used. Notice that ReactToMidnight(), the BlueprintImplementableEvent, is not defined here. A BlueprintImplementableEvent is declared (its existance) in our interface, but defined (its behaviour) in blueprints only. To determine if an actor implements an interface in C++, simply cast your class to the interface, if it returns NULL then the object is not using it. If it is successful, you can use that pointer cast to the interface to call your function, which will execute from the proper class. From the above code you can see that the function is being called off of the interface, you never even need to know what type of object you're dealing with, just whether it supports the interface you need. It produces different results depending on the actual class it is, calling the overridden function. This is called polymorphism. Once this is all implemented, the classes that you have set up with the interface in C++ will have its interface functions appear with the blueprint's variables and other functions. Again, your function must have a return value for it to appear in this list, otherwise it is considered an event and cannot be overridden as a function. 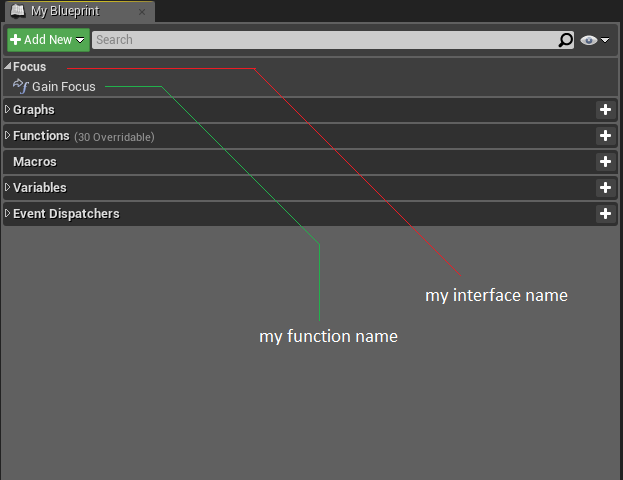 You can however use the event from the interface in blueprint's event graph and override it that way. Each actor can respond to an event in their own unique way. While it's a little bit more complicated of a setup it helps keeping the code very simple and is much more performance friendly than casting to multiple different types of classes!